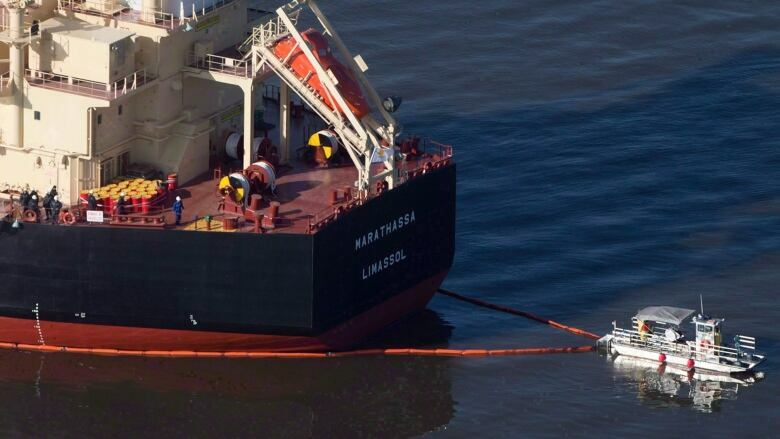 A judge has cleared the MV Marathassa of charges arising from an April 2015 oil spill in English Bay. The cargo ship MV Marathassa has been acquitted of the last charges it faced relating to the April 8, 2015, spill that saw 2,700 litres of bunker fuel dumped into Vancouver's English Bay. On Thursday, Judge Kathryn Denhoff acquitted the ship of charges under the Canada Shipping Act, ruling that while the ship discharged a pollutant, she accepted the ship's defence that it used due diligence in the case. The ship built in Japan was only three weeks old. The judge said that "the hazards in this case of defective alarms and a defective valve were not foreseeable. The Marathassa, the crew and Transport Canada all expected that the brand new vessel would be free of those defects." She also ruled that the Crown had failed to prove the ship and its crew didn't implement an oil pollution emergency plan. She also noted that "given the extensive training, verification and ongoing monitoring of the crew, the Marathassa took all reasonable steps to ensure that the crew followed the requirements" of the emergency plan. She also acquitted the ship on one charge under the Migratory Birds Convention Act. The spill took more than two weeks to clean up, and outraged environmentalists and some residents.